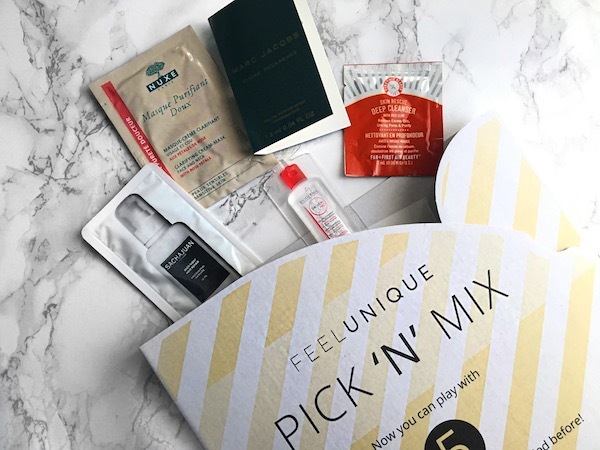 Feelunique started their Pick n Mix service around the end of last year where you're able to choose 5 makeup, fragrance or skincare samples and only pay for delivery (£3.95). 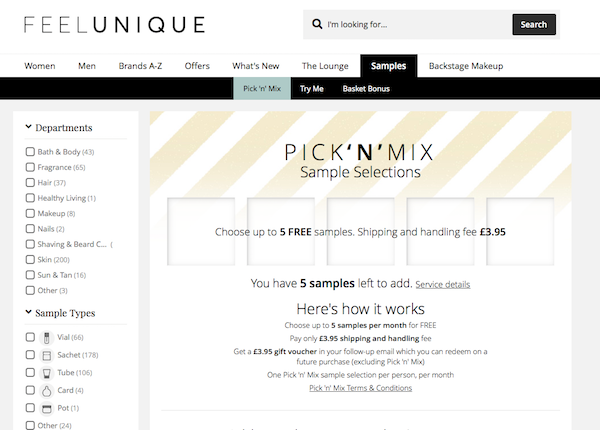 After placing your sample order, you receive an email with a £3.95 voucher code for you to use on any future orders with Feelunique. I totally think the sample service is a good idea, it gives you a chance to test out the products and see if you like it before splurging on the full sized product. You are only allowed to place one Pick n Mix order per month. They currently have over 300 different samples from you to choose from and every month they do change up the products. The mobile version of the website cuts off a lot of vital information. For my first Pick n Mix order last month, I ordered via my phone. When placing my second order this month via my laptop, I noticed the information per product was much more clearer i.e. the size of the samples and the types available. 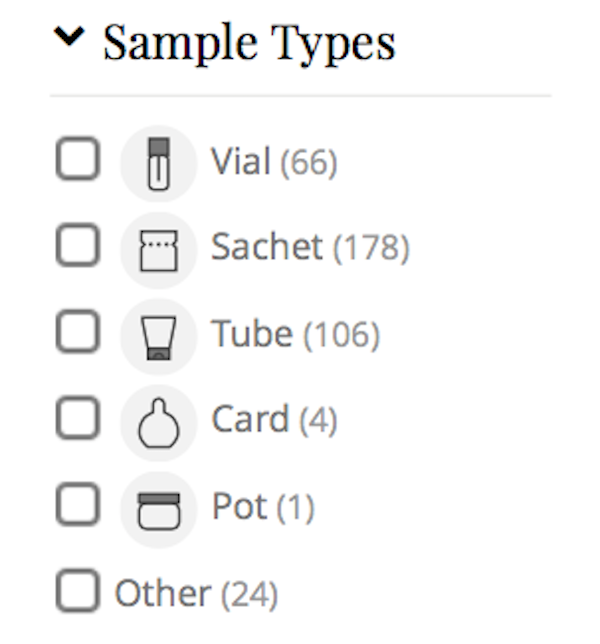 Filter the samples into tube/pots/other under the sample type category on the left hand side. I don't mind sachet samples, but I feel like they tend to be the messiest and you don't really get much product. Whereas with the tubes and pots tend to be a tad more generous and look way more prettier for pictures - yay! 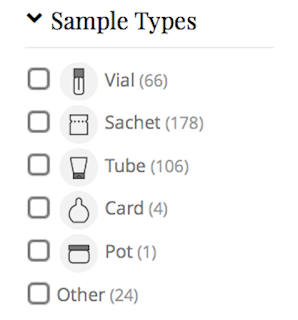 If its fragrances you're after, you may want to click the Vial option under sample types. 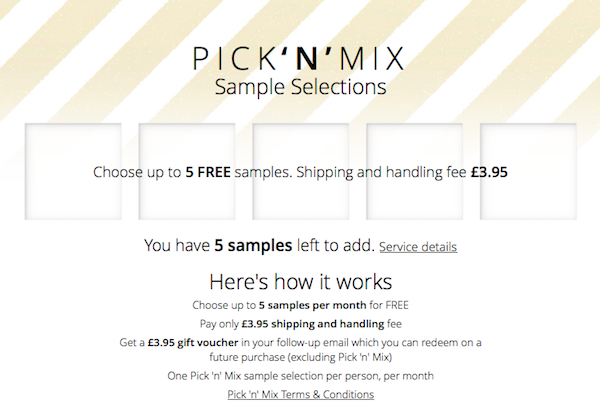 Here you are free to choose your 5 samples! I've been wanting to try this brand out for a while as my hair and been looking and feeling quite dry recently. There was quite a bit of product in the sachet so I used half first. After my first use I noticed my hair feeling a lot more moisturised, soft and smelt so good. I was so excited to use the second half of the sample and of course ordered the full size. I feel like because I'm so into makeup and skincare, I totally disregard the health of my hair, but not anymore! Another sachet that has quite a bit of product inside. I used before bed and kept it on for 20-25 minutes as opposed to the 10 minutes written on the instruction. After washing off my face and neck felt extremely hydrated, soft and plump - everything I want my skin is always be. I am a huge fan of all the Marc Jacobs perfumes released so far. The Decadence range is the newest and there are two version; Divine and the EDP. The thing that drew me to this perfume the most is the fact that it's shaped in the form of a handbag - how cute and unique! I was luckily gifted the EDP version which smells much nicer than the Divine. I never got around to trying the Bioderma Micellar water because of how hooked I was on the Garnier version for a fraction of the price. It removed my makeup well on my sensitive skin and did not require harsh scrubbing when removing my mascara. It is a good micellar water but I still think the Garnier is a really good cheaper alternative that does exactly the same thing. I think it was Onika that mentioned this on her Instagram/Snapchat recently (or maybe it was the mask). And I was eager to try something from the brand so I picked up the cleanser as it's something I would definitely use. I used it after removing my makeup with my Magnitone cleansing brush and I loved how it made my skin feel super soft. I did find it a tad bit drying but nothing that good ol' facial oil couldn't fix.